Halloween is here, it is time for some Halloweenish Giveaways. This means DVD's and More! 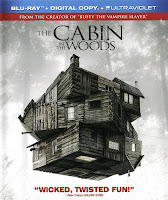 The first giveaway will be The Cabin In The Woods. This is a Horror/Thriller Movie. Not for the kids. Don't want to wait to win? You can buy this movie now on Amazon for $19.96 Click below to buy! Enter with the Rafflecopter below. US ONLY Winner will have 48 hours to respond to winning email. MAX of 2 people per household as long as you both use separate emails to enter. Must complete the mandatory entries to qualify. Please give the RC time to load The first 5 entries are mandatory meaning to qualify to win, you must complete them. The rest are optional but will increase your odds of winning. GIVEAWAY ENDS 10/8 at 12:01 AM CST. Yes me and my husband loves them. Kids not so much lol. but gives me and the hubby something just for the two of us. Kind of. It depends on the percentage of gore to actual plot. I am a major horror fan. I don't know anyone that loves horror as much as I do, unfortunately. Majority of the movies I have in my collection are horror. And I'm not a picky horror fan either, I like some low budget horrors too. I was SO excited about The Cabin in the Woods because Joss Whedon is my favorite since he created Buffy. I've been a LONG fan of horror and Buffy, since I was a young child. I am a big horror fan, and this is the best horror movie I've seen in ages! It's also the most entertaining horror comedy ever made in my opinion. Yes, I'm a horror fan! I'm a huge horror movie fan!!! Ellie, Please repost your reply! it was deleted by mistake. I am an insanely HUGE Horror fan! Also, The Cabin in the Woods was my second favorite movie of the year (right behind The Avengers). Joss Whedon definitely won the year for me! I am a fan of horror movies!! Just saw this one last week at home, rented it on apple tv and had to wait for my 1 year old bedtime to watch it with hubby, cant go to movie theaters until DD grows up a bit more :) We both enjoyed it. I like horror movies that are clever and scary; I don't like gore-fests. YES! We are a Horror movie family! Every year on Oct 1st, (my daughter 's b-day), she goes through our movie collection and tries to line up a classic horror movie for nearly every night. Last night we were up until 2am watching The Walking Dead on Netflix! I'm not a huge fan but I do enjoy a good one now and then. Hubby loves them.